NC Board Certified Family Law Specialist Melissa Averett of Averett Family Law in Chatham County is pleased to announce that House Bill 343 has passed and will take effect October 1, 2017. 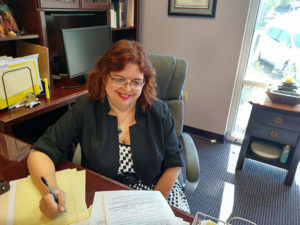 Last year, in her capacity as chairperson of the Domestic Violence Committee of the NC Bar Family Law Council, Attorney Averett proposed legislation to clarify whether Domestic Violence Protective Orders can be modified. Attorney Averett proposed the change because some courts were refusing to allow modifications to protective orders. Because Chapter 50B of the North Carolina General Statutes did not explicitly permit modifications, some courts interpreted that to mean that modifications were not allowed. Other courts found implicit authority in the statue and would permit modifications. 50B-3. Relief. … (b2) Upon the written request of either party at a hearing after notice or service of process, the court may modify any protective order entered pursuant to this Chapter after a finding of good cause. A BILL TO BE ENTITLED AN ACT TO PROVIDE THAT SUBSEQUENT ORDERS RELATED TO CUSTODY, CHILD AND SPOUSAL SUPPORT, AND POSSESSION OF PROPERTY SUPERSEDE LIKE PROVISIONS IN TEMPORARY CUSTODY ORDER. “§ 50B-7. Remedies not exclusive. (a) The remedies provided by this Chapter are not exclusive but are additional to remedies provided under Chapter 50 and elsewhere in the General Statutes. (b) Subsequent orders entered pursuant to Chapter 50 of the General Statutes related to custody, child and spousal support, and possession of property and subsequent child support orders entered pursuant to Chapter 110 of the General Statutes shall supersede like provisions in an order issued pursuant to this Chapter.” SECTION 2. This act becomes effective October 1, 2017, and applies to orders in effect on or after that date.